In this age of electronic communication, it’s important that we teach our kids how to communicate well. Taking the time to train them in being good listeners and communicators is more caught than taught. In other words, they model what they see around them, especially in us as parents. No electronic device has pervaded teenage life like cellular phone devices. I read that 86% of Americans own a cell phone. Like so many mainstays in society, the answer rarely lies in the lifetime ban but more in the moderation mode, teaching teens how to use things appropriately. Like them or not, the cell phones are here to stay. Of course, now the “phones” are more powerful than computers were not too long ago. They are mini laptops doing everything from surfing the web to finding directions across town. I asked one of my kids the same question about texting, “I don't get why y’all text. Why don't you just call each other?” By the way, did you know the average American teenager texts 80 times a day? My kids explained to me that they like texting because then you don't have to take the time to listen. Therein lies the problem with modern communication devices. I call them “lazy communicators.” True, they are efficient, but they also break most of the healthy communication rules: no non-verbal cues, no listening feedback and a focus on the person speaking. The cell phone is advantageous for interpersonal socialization. But the cell phone should not replace healthier forms of communication. Remind your kids and teens that when the issue is important, face-to-face is always better. Encourage your teen to make the phone call instead of texting when the message involves more than something just informational. Bottom line is, when the communication is important, avoid using email or texts. It’s better to discuss issues on the phone but the best way is face-to-face. You decide when your teen is mature enough to handle the responsibility of a cell phone and be sure to set the rules and parameters for it’s use. 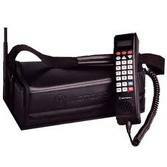 Let them know that if they bend the cell phone rules, they’ll have to carry a bag phone!